With utter joy, I proudly present my crochet puffin pattern! 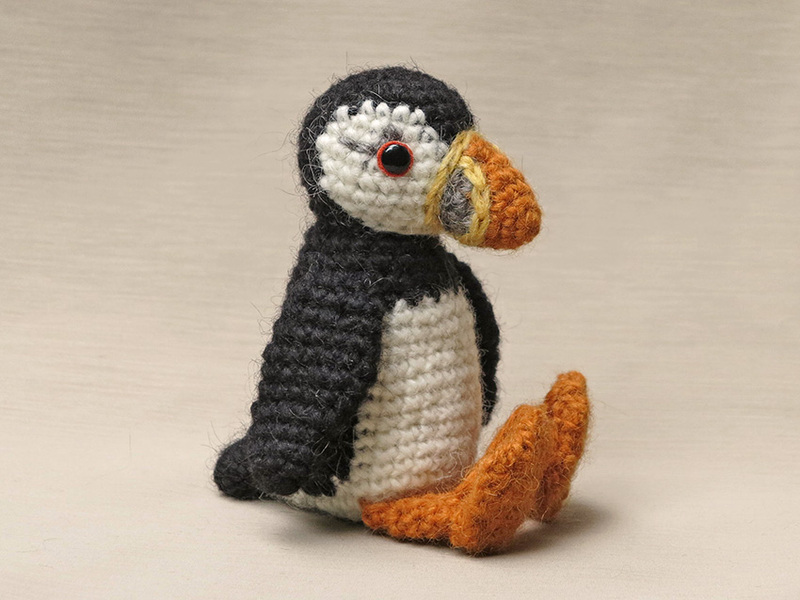 Meet Plubby, a proud and happy fluffy crochet puffin. When I saw a puffin while being on holiday to the UK, I immediately knew I had to make a crochet pattern of this spectacular bird. I had thought of it before, but never actually got to making one. It was quite a journey, making this pattern. Mainly because I got ill and it took me a long time to recover from it. But now when this pattern is finished, I am ever so thrilled with the result. The head was a joy to design. Finding the correct circled shape for the white parts was a bit tricky but very rewarding when it was finished and looking good. With the bill attached, I had a very striking puffin head. And blimey, it was even shown in BBC’s Springwatch Unsprung, what it thrill that was! But then for the rest of the puffin…. Halfway through, I got stuck a bit, because I had no idea how to make the wings. What I had in mind looked way too bulky and more realistic flat wings I considered not an option. I took a break and went on designing some other parts of the doll. The tail was such a pleasure to design. At first, I had in mind to make the tail in two pieces, but when trying it, it looked rather silly. Suddenly I had this idea of a one piece tail. I made a test version and it worked perfectly. The white bottom combined with a part of the tail sewed flat, created the perfect looking ‘feathered’ flap. What a few tiny stitches can accomplish! When I pinned the puffin together, I realized I had to make simple, arm like wings, just like my other Popkes have, but a bit more wing like. That was the perfect finishing touch for the puffin. Plubby had come to life! Here are some more shots of my dear Plubby. Below it you can find more info about this crochet puffin pattern. Plubby is sitting 5,1 inch / 13 cm. He is made with Istex Lett Lopi, a 100% wool yarn. I’ve used five colours to make Plubby, from which three are basic. Black, white and orange. For the grey and yellow colours of the bill, you only need just a bit. Like all my patterns that contain colour changes, the complicated rounds in which you need to de- and increase are written in stitch colour to make changing colour as easy as it can get. I would strongly advice the use of a fuzzy yarn, as it leaves much neater colour changes. The pattern for this cheerful puffin, you can find in my shop and in my shop at Ravelry. 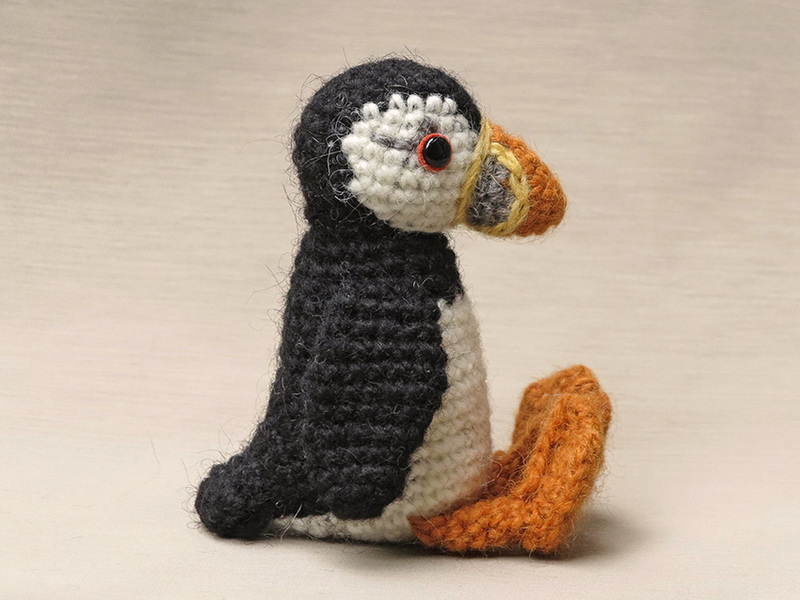 It contains a clear description of how to crochet and attach the puffin with example pictures at the bottom to help you get everything right. 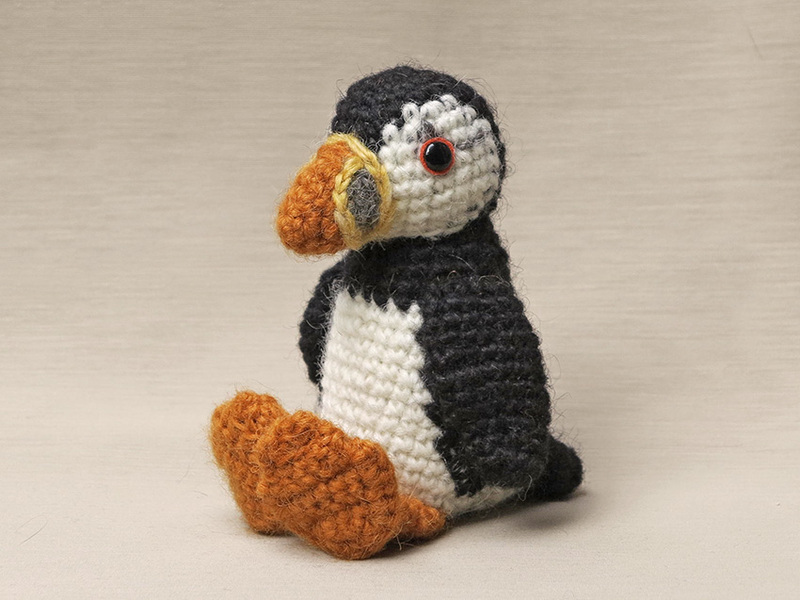 In the pattern you can also find what materials you need, the Lopi colour numbers, in short, everything you need to know to make your own crochet puffin! And heads up, the pattern has a one dollar release discount till the 3rd of August! Hi Eleonora, I tried very hard to capture the puffin’s whimsical character and I’m glad you say I captured his cheeky charm! Thanks for buying the pattern and happy crocheting. I just want to hug him Sonja. Fantastic job! Very Puffiny! Lovely to see you here Jan! Glad you like my cheeky Plubby. Sonja does the pattern mainly use amigurumi but with detailed shaping? He is so good and I hope to see puffins sometime this summer. Hi Beverley, thanks! It is a pretty basic pattern actually. The whole puffin is made with the single crochet stitch and the shaping is done with de- and increases. Is that what you meant to ask? Where are you going to see puffins? I ones tried to see them at Runde, a Norwegian Island and this year I saw one at the RSPB Bempton cliffs in the UK. Thank you Sonja your description is perfect as it is basic stitches I have used before. I mainly knit but have enjoyed crochet projects and yours are all beautiful. I will purchase the pattern tomorrow. Hopefully I can then progress to your other patterns as they are all perfect. I hope to visit the Rathlin Islands (Northern Ireland) if our weather improves to see the puffins. I think there are more in the north coast which we hope to see one day soon. I can only dream of visiting Norway! Very pleased you are feeling well again and enjoying your creative talents. That is wonderful. If you need any help when making the puffin, you can always ask me! Your critters are so cute!! Do you have a book out? lol Maybe I am way behind in my knowledge! If I ever publish a book, it will be a special one with patterns and artwork. Like a children picture book full of animals to read about and make!